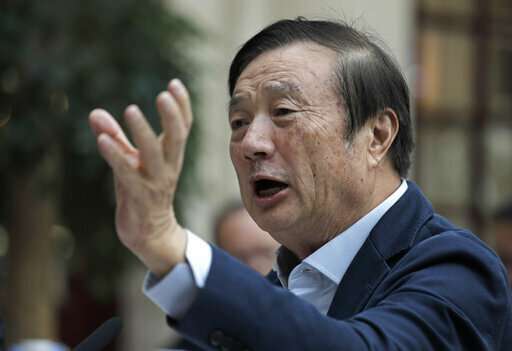 The founder of China's Huawei, the world's biggest supplier of network gear to phone and internet companies, says his company would not share secrets about its customers and their communication networks. 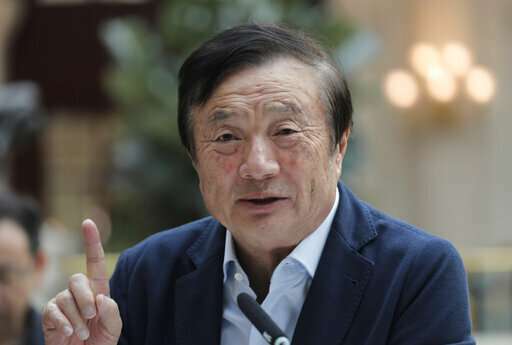 Ren Zhengfei spoke in a rare meeting with foreign reporters as Huawei Technologies Ltd. tries to protect its access to global telecom carriers that are investing heavily in next-generation technology. His comments were the 74-year-old former military engineer's most direct public response to accusations his company is controlled by the ruling Communist Party or is required to facilitate Chinese spying. Huawei is China's first global tech brand. The United States, Australia, Japan and some other governments have imposed curbs on use of its technology over such concerns. "We would definitely say no to such a request," said Ren when asked how the company would respond to a government demand for confidential information about a foreign buyer of its telecom technology. Ren said neither he nor the company have ever received a government request for "improper information" about anyone. Asked whether Huawei would challenge such an order in court, Ren chuckled and said it would be up to Chinese authorities to "file litigation." Huawei is facing heightened scrutiny as phone carriers prepare to roll out fifth-generation technology in which Huawei is a leading competitor. 5G is designed to support a vast expansion of networks to serve medical devices, self-driving cars and other technology. That increases the cost of potential security failures and has prompted governments increasingly to treat telecoms communications networks as strategic assets. The company's image suffered a new blow last week when Polish authorities announced one of its Chinese employees was arrested on spying charges. Huawei announced it fired the employee and said the allegations had nothing to do with the company. Ren is the father of Huawei's chief financial officer, Meng Wanzhou, who was arrested Dec. 1 in Canada on U.S. charges related to possible violations of trade sanctions on Iran. Ren said he couldn't discuss Meng's case while it still was before a court. 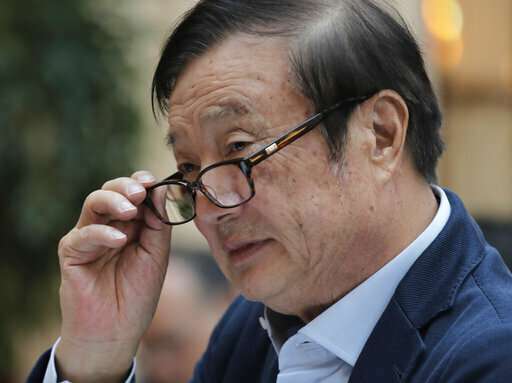 But he said Huawei obeys the law, including export restrictions, wherever it operates. Ren expressed gratitude to Canadian justice officials for their treatment of Meng, who was released on bail and is staying in a house in Vancouver. He also expressed thanks to her fellow jail inmates prior to her release "for treating her kindly." "After all the evidence is made public, we will rely on the justice system," he said. "We are sure there will be a just conclusion to this matter. Two Canadians were arrested by Chinese authorities on national security charges, prompting suggestions abroad they might be hostages to secure Meng's release. On Monday, a Chinese court announced another Canadian had been sentenced to death in a drug case after he was ordered retried. Asked how he felt that Huawei was linked to accusations Beijing took hostages, Ren said he saw no connection between the Canadians and Meng's case. Dressed in a blue sport coat and an open-necked light blue shirt, Ren was jovial and animated during the two hour and 20 minute meeting. Ren said he became a Communist Party member in the early 1980s after the state press published reports about his development of a measuring tool for an engineering project. Earlier, he couldn't join because his father was deemed a "capitalist roader," but the party was trying to promote young, technologically capable people after the violent, ultra-radical Cultural Revolution in 1976. Ren founded Huawei in 1987 to sell imported telecom switching gear to Chinese phone companies after the PLA disbanded his engineering unit, according to the company. Despite his party membership, Huawei makes decisions based on its customers' needs, Ren said. "I don't see a close connection between my personal political beliefs and our commercial decisions," he said. Huawei's U.S. market evaporated in 2012 after a congressional panel said the company and its smaller Chinese rival, ZTE Corp., were security risks and urged phone companies to avoid them. But Huawei passed Sweden's LM Ericsson to become the biggest supplier of network gear and its smartphone brand displaced Apple Inc. last year as the No. 2 global seller behind Samsung. The company forecasts last year's revenue will exceed $100 billion for the first time. Ren said this year's target is $125 billion. Huawei says it is employee-owned. Ren said no government entity or any other investor who isn't a current or former employee owns "one cent of Huawei shares." Ren said Huawei has no research cooperation with China's People's Liberation Army and no dedicated unit for military sales and he knew of no PLA purchases of civilian technology. Ren said the security concerns have yet to have a significant effect on Huawei's business. The company has signed 5G contracts with 30 carriers and has shipped 25,000 base stations, he said. Huawei has plenty of opportunities even if it faces higher barriers in some markets, he said. "If we are not allowed to sell in certain markets, we will have a smaller operation," he said. "So long as we can feed our employees, we are satisfied." Ren defended Huawei's decision to remain privately held—a status that has fueled questions about its intentions and who controls it. He said that helped to preserve its long-term focus on customer service and product development. Publicly owned companies care more about a "beautiful balance sheet" while Huawei is focused on a "strong industry structure," he said. "Capital tends to be greedy." Ren also warned against allowing security concerns to divide the globe into isolated markets with incompatible technology standards—a scenario some people have suggested might result from U.S.-Chinese tensions. "Arbitrarily dividing the world into two technology camps can only harm the interests of all society," he said. Asked about President Donald Trump's suggestion on Twitter that he might intervene in Meng's case if that facilitated a resolution of Washington's tariff battle with Beijing, Ren said he would wait to see whether Trump takes action. "As for President Trump as president, I still believe he is a great president," Ren said. He said Trump was elected to cut taxes, which he believed was beneficial for American industry. However, he said, "If companies are getting frightened by the detention of certain individuals, then investors might be scared away, and that is not in the interests of the United States." Ren said he didn't believe Huawei would face U.S. penalties similar to those that nearly drove smaller Chinese rival ZTE Corp. out of business. Washington barred ZTE from buying American technology over its exports to Iran and North Korea but restored access after the company paid a $1 billion fine, replaced its executive team and installed U.S.-selected compliance monitors. "What happened to ZTE, I don't believe will happen to Huawei," said Ren. However, he said, "if it did happen to Huawei, I don't believe the impact would be very significant. I believe telecom operators would continue to trust Huawei." Ren said Huawei doesn't want Beijing to retaliate for foreign restrictions by hampering market access for Apple Inc. and other rivals. "In spite of setbacks in some countries, we are still supportive of China becoming a more open country." © 2019 The Associated Press. All rights reserved. The company might deny giving information to their govt, but certain employes almost certainly would "unofficially". Then turn over the source code.